In 859 AD China, the incompetence of the emperor has led to civil unrest with rebel armies forming against the government. 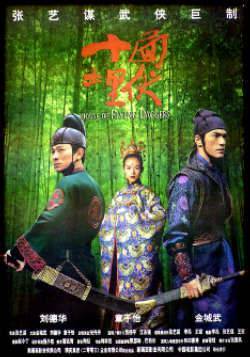 Local army captains Leo and Jin (Andy Lau, Takeshi Kaneshiro) are assigned with the duty to capture the new leader of the rebel group, the House of Flying Daggers. Learning that they're based out of a local brothel, they use the trust of a beautiful blind dancer Mei (Ziyi Zhang) to seek out this leader, but when one of them falls in love with her, it creates a situation far deeper than the politics of battle.